If you ever grow tired of those cold Canadian temperatures or the same old food and beverage experiences, we’ve got the place for you. Gaucho Brazilian Barbecue will transport you into ancient Brazilian culture where you’ll enjoy authentic South American fare, traditions, and atmosphere. Gaucho does not cut any corners when it comes to authenticity, and this shows in both their food and their remarkable atmosphere. “The eclectic décor, Rodrigues family photos, sunny atrium, and street-side patio contribute to the exciting dining experience. Warm blonde wood floors complement white and red brick walls, and silhouette cutouts of cowboys and horses remind patrons of the origins of the dishes they’re eating. 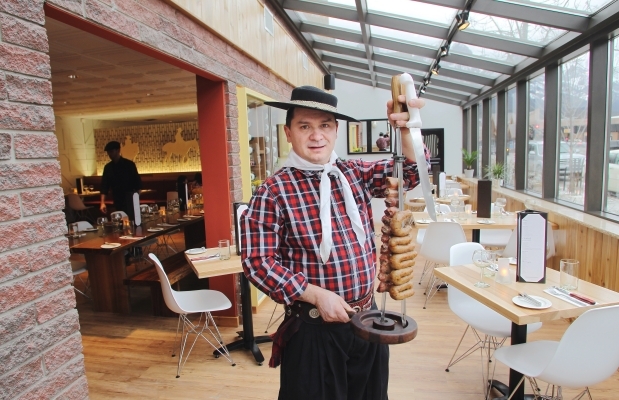 Gaucho Brazilian Barbecue is great for a unique date idea or a fun celebratory meal” said Petr. But, most importantly, what are they offering for Canmore Uncorked? Good question. This year they will be serving their popular Dinner Rodizio, so “be ready to get your meat sweats on,” they warn. You’ll get to feast on an all-you-care-to-enjoy authentic Brazilian steak house experience, featuring 6 types of meat and only triple-A certified Angus beef carved right at your table. With the 98% gluten-free menu, salad bar, and hot bar there's something for everyone to enjoy! Canmore Uncorked is going PAPERLESS! What’s The Iron Goat Cooking Up This Year?